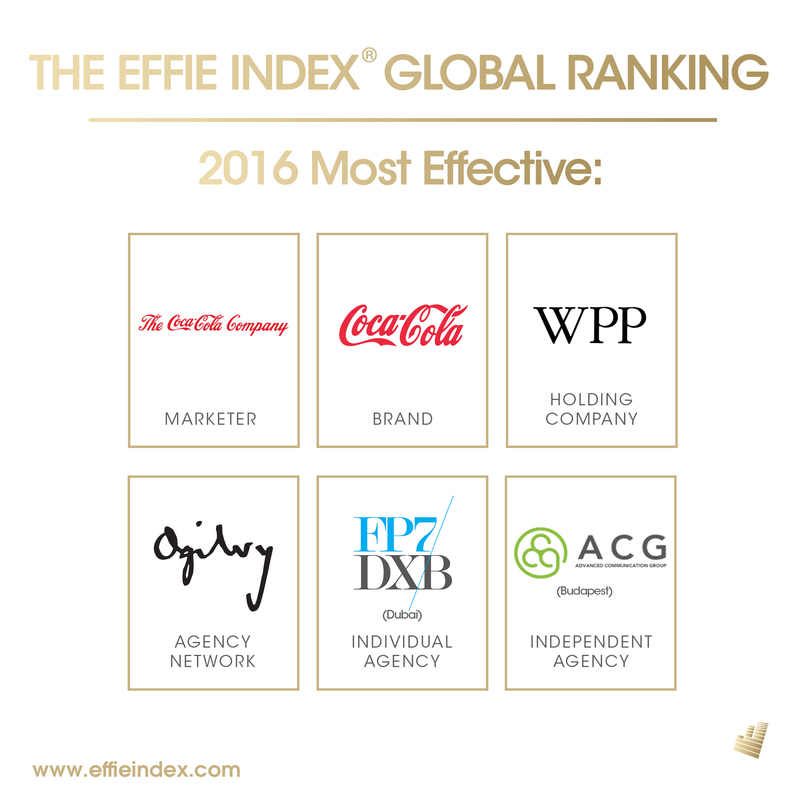 New York (April 27, 2016) [Updated: April 27, 2016; 3:40pm EDT)— Effie Worldwide released the global results for the 2016 Effie Effectiveness Index—the foremost ranking in the marketing and advertising industry— listing the most effective marketers, brands, agency holding groups, agency networks, agency offices and independent agencies around the world. “For nearly 50 years, the Effies have been the gold standard for effectiveness and the Effie Index, now in its sixth year, has emerged as the measure by which our industry defines success,” said Neal Davies, President & CEO of Effie Worldwide. “The anticipation and jockeying for top rankings is built up throughout the year and it is always exciting to see which agencies in particular, come out on top." The Coca-Cola Company (marketer), Coca-Cola (brand), WPP Group (agency holding group), BBDO Worldwide (agency network), Sancho BBDO - Bogotá (agency) and a tie between El Almacén (Buenos Aires) and Only If (Mexico City) (independent agency). The Coca-Cola Company (marketer), Emirates NBD (brand), Interpublic (agency holding group), McCann Worldgroup (agency network), FP7/DXB - Dubai (agency) and MINT - Dubai (independent agency). Effie Worldwide is a 501 (c)(3) nonprofit organization that stands for effectiveness in marketing communications, spotlighting marketing ideas that work and encouraging thoughtful dialogue about the drivers of marketing effectiveness. The Effie network works with some of the top research and media organizations worldwide to bring its audience relevant and first-class insights into effective marketing strategy. The Effie Awards are known by advertisers and agencies globally as the pre-eminent award in the industry, and recognize any and all forms of marketing communication that contribute to a brand's success. Since 1968, winning an Effie has become a global symbol of achievement. Today, Effie celebrates effectiveness worldwide with the Global Effie, the Positive Change Effie, the North America Effie, the Euro Effie, the Middle East / North Africa Effie, the Asia Pacific Effie, the Latin America Effie and more than 40 national Effie programs. For more details, visit www.effie.org. Follow @effieawards on Twitter and on Facebook.com/effieawards for updates on Effie information, programs and news.